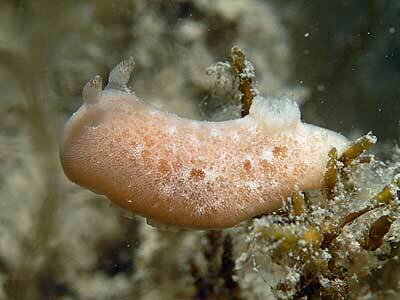 MOLLUSCA : NUDIBRANCHIA : Kentrodorididae SNAILS, SLUGS, ETC. Description: J. tomentosa is yellow to sandy brown in colour. The mantle is velvety in appearance and to the touch. This effect is created by the presence of numerous, small, uniform tubercles. Usually there are several pairs of dark brown spots on the sides of the mantle, however the variety lemchei lacks these spots. Individuals may reach a length of up to 55 mm. 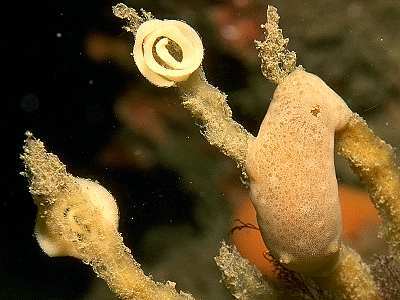 Habitat: This animal may be found on the shore and in the shallow subtidal. 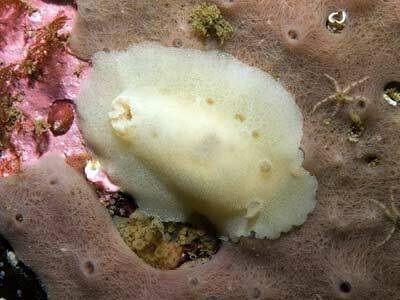 It feeds on a variety of sponges, but especially on species of Haliclona including Haliclona oculata and Haliclona cinerea. The spawn is a broad ribbon laid in a neat, tight coil. Distribution: Found all around the British Isles and from the Faeroes to the Mediterranean. Mantle covered with even spiculose velvety tubercles. Plain beige or grey in colour with a few dark spots. Picton, B.E. & Morrow, C.C. (2016). 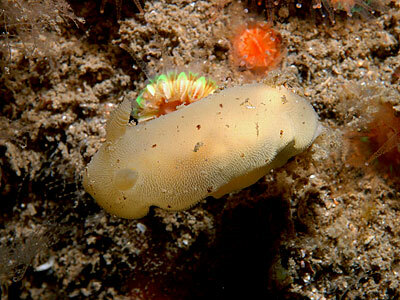 Jorunna tomentosa (Cuvier, 1804). [In] Encyclopedia of Marine Life of Britain and Ireland.